Sometimes it can be hard to know whether you have a pet emergency or not. When it comes to things that can absolutely not wait, though, feline urinary obstruction tops the list. Savvy cat owners need to be able to recognize signs of a blocked cat so that the staff at Summeridge Animal Clinic can get started helping without delay. When there is any kind of an obstruction of the flow of urine from the bladder through the urethra, problems can ensue. While this type of obstruction can happen in any cat, male cats are predisposed to blockage because their urethra is longer and more narrow than that of their female counterparts. Certainly a blockage such as a urinary stone can cause this problem, but in the feline family there is another more common cause for urinary obstruction. Feline lower urinary tract disease, sometimes also called feline interstitial cystitis (FIC), is most often the culprit when it comes to this issue. Feline lower urinary tract disease (FLUTD) is an inflammatory condition of the bladder. When inflammation occurs cellular debris accumulates within the bladder in the form of a snowglobe-like phenomenon. This cellular debris can settle into the urethra, forming a plug of urinary crystals, inflammatory cells, and mucous rendering the cat unable to pass urine. No matter what has caused the blockage, though, the end result is the same: a cat who cannot urinate is in trouble. Feline urinary obstruction is painful. Eventually the accumulation of waste products in the body and/or the rupture of the bladder will cause death, making this a kitty emergency of epic proportions. Any of these signs is worthy of an emergency visit. 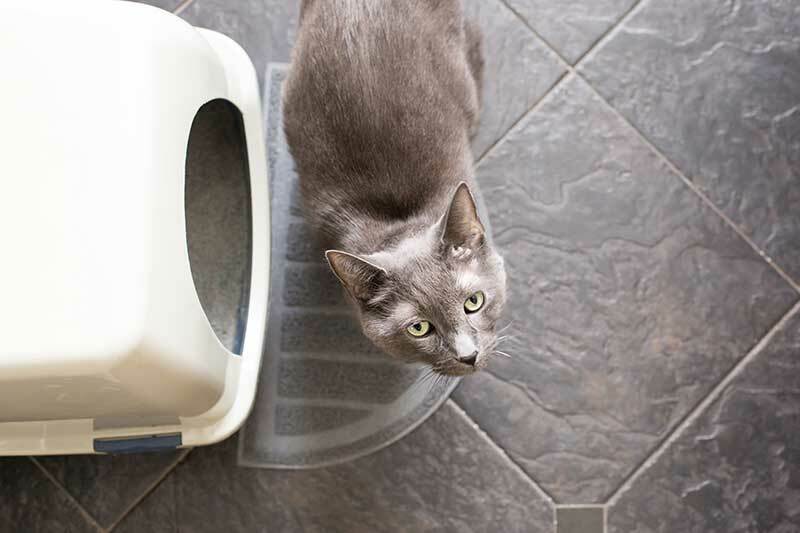 Even if your cat is not blocked yet, these symptoms indicate a problem that warrants treatment and monitoring so that urinary obstruction does not occur. If there is any possibility that your cat might be blocked, it is essential that you call us right away. It is an absolute priority to remove the blockage right away. Typically this is done by passing a urinary catheter to open the urethra. If urinary stones are present, sometimes surgery is required to remove them. Once the urinary blockage is relieved, most cats need supportive care in order to help their systems return to normal. Many times a urinary catheter is left in place until inflammation in the bladder and urethra has subsided. Most cats also benefit from intravenous fluid administration to restore normal hydration status. Many cases of feline urinary obstruction reoccur. This makes monitoring your cat closely very important. It is also imperative that we work together as a team to reduce recurrences of episodes of FIC or stone formation through strategic diet changes, stress reduction, and multimodal environmental enrichment. In some situations surgery is also warranted in order to make obstruction less likely. Feline urinary obstructions are serious business. If you think that your cat may not be able to urinate, don’t delay seeking help. Your team at Summeridge is happy to help with any questions or concerns you might have. Previous: Make Tick Prevention a Priority!